For over 50 years, the Humane Society of Sheboygan County has served the community with the goal of improving the lives of animals in need. As a private, non-profit organization we do not receive local or national government funding. We depend on people who generously give to the animals and the programs that support them. Our achievements have been made possible with the kindness of our donors. 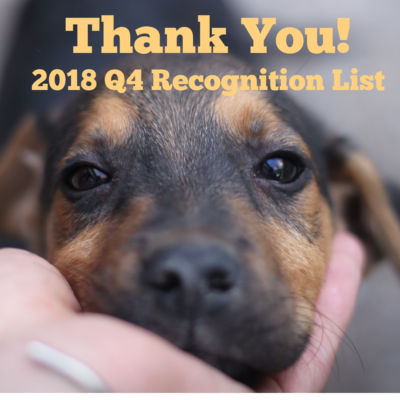 This year we would like to say THANK YOU to our generous supporters who contributed during the fourth quarter of 2018. These donations included Annual Appeal, Capital Campaign, and miscellaneous donations. Rayah Halbach Terry Ourada Baird Foundation, Inc.
Christine Hanson Sarah Parker G.G.I. Terri Hermann Jeff Prill Securian Financial Group, Inc.
Amy Heyman Laura Raebel Thomas Co.
Diana Hierlmeier Arlene Ramey Torginol, Inc.